These are all titles that I’ve been given in my lifetime (and many more). But, the last one I was given when I first started the adventure of my business to help Scoliosis patients by providing the undergarments that I had designed with all of their needs in mind – that I had designed for my children. “Just a Mom”…it kind of stung. It was a title given to me by someone in the industry (I won’t name names) who wanted to poo-poo my ideas – my aspirations – right from the get-go. Of course, someone who had a slightly comparable product, who obviously didn’t think that my ideas were any better than his, so I understood his motives and moved on anyway. But, then again, why should “Just a Mom” sting? If I weren’t a Mom, I could never bring products to other patients and Moms like me in the manner in which I do it. And, if I weren’t also all those other things – Engineer, Inventor, detail-oriented, child of wonderful influences, creative – I couldn’t be “Just the Mom” that I am – “Just the Mom” that nobody else can be or is. So, “Just” in time for Mother’s Day, I want to encourage all of you “Just Moms” out there. I read so many of your comments, emails, and facebook posts and messages – I hear from Designers, Doctors, Lawyers, housewives, and everything in between – all of us, when diving into the world of our children’s illnesses, become “Just Moms” in the blink of an eye. It’s all we can think of, all we can process and grasp because when your child is suffering, no matter what your career or occupation, you become “Just the Mom” that you are to your core. Recently, I had the honor of being the recipient of a highly prestigious award. I will post more about it later, but the AATCC, one of the premiere textile organization in the world, honored me with their Young Entrepreneur of the Year award (yes, miraculously, they still consider me young!). I spent 3 days at their conference in North Carolina last month, getting wonderful treatment and recognition for my hard work and service in the field of textiles. So, in the span of 5 years, I went from “Just a Mom” who “didn’t know what she was talking about” to “Just a Mom” who is making a difference and getting legitimate recognition for it. As I was preparing my 30 minute presentation for the conference, I couldn’t help but be daunted by the crowd I would present to – most had PhD degrees in Textiles, were heads of large textile and/or Chemical corporations, or were much higher on the business scale than I am. I just felt so intimidated. They would think I was just a Mom with no business being there! But, then I realized – I am there BECAUSE I am that Mother that God purposed me to be. I am there BECAUSE I am a Mom, NOT in spite of it. Yes, I am all those other things, but wear all my titles with equal pride. So, I got up in front of hundreds of people, owned the fact that I am who I am and I do what I do because of it, and thanked all of those high achieving people for their recognition of “little old me”. I was honored, humbled, and then reminded – this is who you were MEANT to be. Don’t discount yourself. And, don’t discount others – who knows the potential lurking inside every single person you meet? This poster met me every day of the conference. 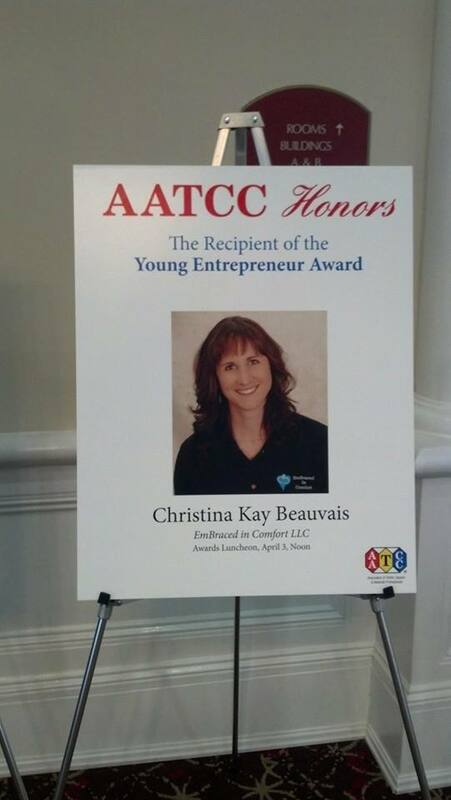 Thank-you AATCC for recognizing Entrepreneurs and “Just Moms” Like me. This is my daughter’s first summer out of a brace in 6 years. And, the first one for my son completely out-of-brace. The norm in our family has become sweaty braces, multiple layers, strategizing dressing in order to remain fashionable, and scheduling swimming excursions around “brace time”. It is unbelievable to me that we have finally arrived at a place where we can toss those cares to the wind – temporarily (we still do not take for granted that we may have future bracing with our son). We still have other concerns (like keeping my daughter’s fresh surgery scar covered and protected from the sun and figuring out what she can and cannot do on her current restrictions during her recovery), but today she got a taste of the freedom to come. We are visiting family down South several hours from our home in Michigan and today we enjoyed a family day OUTSIDE in mid-70 degree temps – and, my daughter got to wear a sundress! What fun! My Grandma said “you don’t have to dress up.” But, I said “Grandma, she is happy to be able to wear a sundress and look pretty and be FREE on a sunny day. She hasn’t had that for many years.” So, we slathered the sunscreen on her scar (and stayed mostly in the shade), but she got to enjoy the freedom she has EARNED through years of bracing and through a difficult surgery and recovery. I said “Sweetie, just so you know, your scar is very visible when your hair moves”. And, she replied, “GOOD! I earned it, I want to show it off!”. I continue to be amazed by the fortitude of this pre-teen girl that the good Lord has entrusted into my care, and am blessed by how she inspires me every day. I am also thrilled to see her prance around in a sundress.